These days, it seems that feminism is working at its hardest to be the center of politics. I love and admire girl power, but to me there is nothing more powerful than a woman who revolves her life around God. My mother and father got me a book called Devotions for the God Girl: A 365 Day Journey by Hayley DiMarco as a small Valentine's Day (S/O to Mom and Dad for making me feel not so bad about myself for still being single!) I haven't read it all the way through and I probably won't because there's no chapters, it's all out of order. When it comes to biblical books, I usually just randomly choose a chapter or verse and see what message it brings to me. What I love about this specific book is that it has an index with specific topics (ex. love, fear, stress, etc.) which will take you to a page with a Bible verse and summary that goes along with that topic. In each summary, Hayley talks about that topic and God together to help the girl who is reading (like me!) learn more about her journey with God and discover the girl that He created her to be. It's been a long journey for me to discover who I am meant to be, and it is still a journey in process. I give many thanks to Jesus for allowing me to learn more about myself and the things that I am most passionate about, which I refer to as blessings. He has helped me to be a good individual and to follow important rules, but he also has allowed me to be adventurous and explore my spunky side, which I believe many people who know me well enough can see. He has answered practically every one of my prayers and will continue to do so in the future. He especially comforts me in times when anxiety is stirring over me. Even though it's hard to tell that He is with me during difficult times, I know for a fact that He is because God is everywhere and everything. His schedule is never too busy for a prayer, no matter how big or small. Devotions for the God Girl: A 365 Day Journey is definitely helping me discover the God girl that I am. It is the perfect book to turn to whenever I am feeling low or high. Sometimes I'll look for a specific relatable topic to find inspirational verses, but then there are times when I'll randomly flip through the pages and pick to read the one where my finger stops. I highly suggest this book to any girl who loves Jesus and wants to know more about the individual that they were created to be in His image, as well as to develop a closer relationship with Him. Click the link down below to get the book for yourself! Watching a good rom-com makes ladies dream of being spoiled like the stars. How many times have you seen 50 First Dates and swooned when Henry Roth went to the same cafe day after day, or watched Hitch and wish you were taken on a spontaneous jet ski ride? Romantic movie dates can be fun, creative, and even very extravagant. And you can even recreate some of the dates in real life! To highlight some of the best romantic movie dates and how much they would actually cost, Shari's Berries created this visual. Out of all of the romantic movie dates listed, my two top favorites would have to be Pretty Woman and Roman Holiday. Not only because I adore both Julia Roberts and Audrey Hepburn, but they both feature probably the most expensive yet amazing dates both women and men could ask for. Wouldn't it be your dream to travel around the city of Rome on a vespa scooter, eat gelato, and end the night by dancing? Or be able to wear a beautiful diamond and ruby necklace and fly into San Fransisco by jet to see the opera? Literally, those would be the most perfect dates ever! Of course - this date in real life would literally cost in the thousands. But a girl can dream, can't she??? The difference between those romantic movies was that Vivian and Edward fell in love and lived happily ever after. Ann and Joe have a wonderful day together but, despite falling in love, decide to remain friends when Ann has to return to her princess duties. Despite all of the listed romantic movie dates being so amazing and expensive, not all of them ended with love. In Lost in Translation (which I have never seen but is on my list of movies to watch), Bill Murray's character paid for an expensive hotel in Tokyo along with vodka and whiskey to share with a girl that he admired, but unfortunately they did not become a couple. In 500 Days of Summer, Tom and Summer have pretty cheap dates as a couple (IKEA plus gas being free!). When Summer decides to break up; however, Tom is left depressed and decides to cope with being single by quitting his job and living off of whiskey, orange juice, and Twinkies, which not only cost money - but could cost him his life if he maintains that unhealthy lifestyle. No relationship is worth that. Despite some of these movies not having the happy ending that we all hoped for, that doesn't mean that the romantic and pricy dates shouldn't be any less special. They still mean something! The highlights of romantic cinema are to dress up in the most beautiful attire, eat a fancy meal, and to just to appreciate the kind gesture that the date made for setting up such a wonderful day or night. While many of the movies on the list have dates at high prices, the true cost of those romantic dates is not only the amount of dollars spent but if the relationship between the couple develops into a healthy and romantic one, then the dollar investment does not matter. I don't even mind if movies provide unrealistic expectations, there's possibilities that they can happen in real life! Any date that leads to a happily ever after can never be underrated and is well worth the money spent. I want to give a big shoutout to Shari's Berries for letting me write this blog about the true cost of romantic movie dates, and you should go check out their website and stores! They have amazing chocolate covered treats that would be perfect for any date with that special someone! A full dozen of chocolate covered strawberries costs $49.98, and that's definitely worth it! 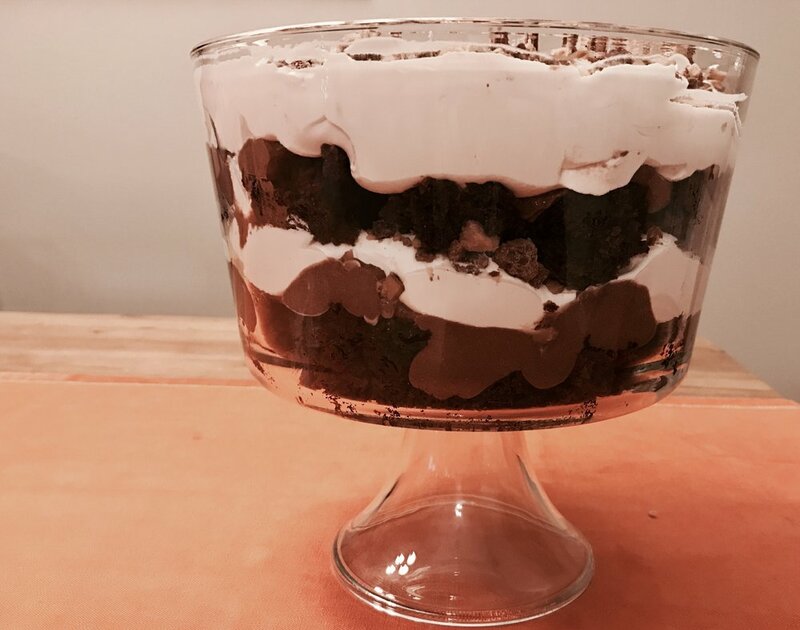 It's kind of like Rachel Green's English Trifle, only without the meat, peas, onions, and pretty much everything she used except for whipped cream. 1.) Preheat the oven at 350 degrees and prepare the brownie batter according to what the package says. Grease the pan, pour the mix in, and bake for 20-25 minutes. Use a toothpick after baking to make sure it was baked long enough. 2.) Crush the Reese's peanut butter cups into tiny chunks with a crushing tool. It would be best to use all the pieces that come in the bag. 3.) Place a third of the brownies in a 5-qt. glass bowl, then spread whip cream and top it with the peanut butter cup chunks. Repeat the layers twice. Finally, place it in the refrigerator until it is chilled and ready to be served. Enjoy! As joyful as the holiday season is, it can be pretty stressful when it comes to getting gifts for family and friends. Even after Black Friday, malls and stores are packed with eager people trying to get their shopping out of the way before Santa Claus comes to town. But why enter crazy crowds to only stress yourself out? Also, why spend buy super expensive? I feel as if stressing over holiday shopping just takes away the Christmas spirit, and that's a waste of time since Christmas only comes once a month every year. Now I am learning how to make my own DIY holiday gifts that my family and friends might enjoy, and one of my biggest ideas is the holiday mason jar gift! I originally saw this idea on Pinterest and in a YouTube tutorial, and it made me want to give it a shot. I first tried this idea last year for my best friend Natalie and she loved it, so of course I have to do it again this year! It's a super perfect Christmas gift, especially for anyone who loves hot chocolate and is a Christmas fanatic. The tips are pretty simple on how to make one. Once you have it ready, Santa might not even have to make a trip to down your friend or family member's chimney! Pour three packs of hot cocoa mix into the mason jar (if you have a smaller pack, one pack should be enough). Then, take a handful of mini marshmallows and place them on top of the mix. Finally, take two to three cookies and place them on top of the marshmallows. Put the lid back onto the jar tightly. Then, use any kind of Christmas ribbon and tie it the top of the jar right under the lid. Finally, place a gift bow on top of the lid. If you can find a candy cane or Christmas tag to go with the jar, that would be perfect! Give your specially made present to a loved one and wish them a very merry Christmas! California is known for the variety of delicious foods. You can't really go wrong with whatever you find or are recommended to try! In-N-Out Burger is one of the most well-known fast food chains in the American Southwest and Pacific Coast. The menu consists of three burger varieties: hamburger, cheeseburger, and my favorite, the "Double-Double". On the side includes French fries, pop (I know it's called soda, but I'm from Ohio), or milkshakes. They also have an online "secret menu" in which you can order additional standard toppings. At the original Farmer's Market in Los Angeles, there are wide options of types of food that are original and hard to find anywhere else, such as candy caramel apples, pizza with over easy egg toppings, fruit juices, and so much more. When my mom and I met our good friends in Mission Viejo, they took us to Creamistry. It's a creamery in which they use only nitrogen and cream to make ice cream, and you can watch the process before they give you your ice cream. It may have been the first time in my life I was actually super fascinated with science! In Laguna Beach, we ate at a very good rooftop restaurant, literally named "The Rooftop", that served both breakfast and lunch. The best part was enjoying a cup of coffee with a great view of the Pacific Ocean! Another breakfast place that was worth going to twice was the Market Cafe at the Loews Coronado Bay Resort. Waffles, oatmeal, and fresh fruit are a great way to start an exciting day in San Diego! It's acceptable to eat ice cream for dinner while on vacation, or perhaps whenever. On the second day while taking a ride on the city trolley, we ate a late lunch at Cafe Coyote in Old Town (it was Taco Tuesday), and we weren't super hungry for another big meal by the time we got back to Coronado. Instead, we went to a popular creamery called Moo Time and got ourselves some ice cream for dinner, and boy was it worth it! I got a birthday cake with cookie dough and sprinkles in a waffle cone and my mom got a mint chocolate chip in a sugar cone. There was a blue flavor called "Silly Vanilla" which I regret not trying, so I'll remember to get that next time! Finally, we ate very delicious hot dogs in Balboa Park on our last day, fresh and thick off the cart! I decided to start an art blog because it is both a talented gift and passion of mine. I love art, all forms of it. Whether it involves writing, painting, drawing, taking pictures, dancing, I find every different kind beautiful. As a little girl, I loved to draw artistic pictures as well as write short stories to go along with them. Using art has always been one of my ways to escape from the depths of reality and to have freedom. I feel like the majority of my anxiety and worries fade away when I use my creativity freely. I believe one of the big reasons why I want a career involving art is because it allows me to stay creative and to have fun while on the job. Plus, I want my creativity and love for art to inspire people, whether artsy or not. Last night, I went to my very first calligraphy class with my mom at a design service shop called Lovely Somethings. This was not my first time learning how to use decorative handwriting, but it was a skill that needed practice. As a creative writer, I would usually spend the majority of my time on the keyboard. When I have handwritten projects, I normally would not take much time to make sure that my writing was nice-looking. I was more interested in the language and grammar. But soon I really began to admire decorative handwriting on invite cards, Pinterest quotes, and even the Declaration of Independence! I mean, imagine how many times it took to write that whole entire paper perfectly?! Seeing how much calligraphy looked beautiful as an art form made me really want to pursue in it. When my mom asked me to join a class with her, I was down for it. I figured it would be a great practice for both my handwriting and painting skills. Even after one full class, I already felt like a pro! While it was tricky to make the letters and lines look perfect, it really paid off. I loved it so much that I worked on my own piece featuring a Grace Kelley quote in the picture above. Of course, I will need to practice more so that I won't mess up too much and ruin my projects. I believe calligraphy will help me enjoy writing thank-you notes and party invites, unlike regular handwriting that I would use just to make time go faster. Calligraphy is a passion that my childhood-self would have longed to discover: a combination of writing and drawing! Interested in shopping at a modern paper boutique shop or taking a calligraphy class? Check out Lovely Somethings for more details about their super cute designs and gifts! I haven't blogged about my dogs in a while, but I took the free opportunity to give some advice for any canine owners out there. Max, our youngest dog, recently got skunked a few weeks ago, and his smell was naaaaaaasty!!!!! That same night Mylie felt very nauseous from the overwhelming smell and accidentally let out some poop inside the house! Skunk odor and doggie crap, that's not a very delicate combination! ne way that helps defuse skunk odor is to fill some plastic cups with vinegar and place them in each spot of the house. It may not be a pleasant smell, but I guarantee it's a good distraction from the stinky canine smell. Spreading tomato sauce on your dog is one of the most recommended tips for getting rid of the smell. It may not work very well at first, but it will smell slightly better than the dog did before. Shampoo magic! It's a really good idea to give your canine a bath right every day until the skunk odor fades away. If you don't give your dog baths very often, it may be a very good idea to start doing it as a daily or weekly routine. Preheat the oven at 350 degrees before spraying the baking tray. Then, melt the butter completely and brush lightly on crescent rolls (separated). Spread brown sugar and cinnamon on the buttered crescents. Then, put an apple slice on the crescent and roll up into a perfect ball. pread melted butter on the rolled up apple pie and spread cinnamon-sugar on top afterwards. Place the pan of the apple pie bites into the oven and cook for about 12-15 minutes. Let the bite-sized desserts harden up and cool down before taking them off the tray. I hope this recipe was helpful for your upcoming Thanksgiving or Christmas party. Happy Holidays!